Morada: Rua Campo de Flores, 3 - Colares, Sintra (Región de Lisboa), Portugal. Featuring free WiFi and a terrace with mountains views, House In The Pines is a holiday home, set in Sintra. 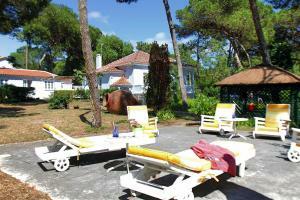 The property is 6 km from Sintra National Palace and boasts views of the garden. Free private parking is available on site. The holiday home is composed of 4 bedrooms and 2 bathrooms, equipped with a hair dryer. The kitchen features a dishwasher, an oven and a microwave, as well as a coffee machine and a kettle. A flat-screen TV is featured. Other facilities at House In The Pines include a barbecue. Quinta da Regaleira is 6 km from House In The Pines, while Moors Castle is 6 km from the property. The nearest airport is Portela Airport, 29 km from House In The Pines.